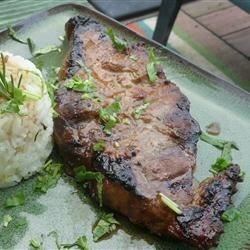 "This is a great marinade for flank steak, my mom got it from a Korean friend when my dad was stationed overseas in the Army 50 years ago." Place garlic, ginger, and onion in the bowl of a blender. Add soy sauce, sesame oil, Worcestershire sauce, meat tenderizer, and sugar. Puree until smooth. Pour the marinade into a resealable plastic bag or glass bowl. Score the flank steak and place into the marinade. Marinate overnight in the refrigerator. Grill steak on preheated grill to desired doneness, about 7 minutes per side for medium. With all the soy sauce (even reduced sodium) it was very salty. I'll try it again with less soy. I live in South Korea right now and this is a great recipe! It works well with pork ribs/steak, too! Wrap the cut up pieces in bib lettuce and enjoy with rice!